6:10 a.m. Late for my meeting with God. Made some coffee and curled up on the swing in the cool of the morning. We talked. I looked around and saw the beauty. Made a mental checklist of things to be done in my “extra” couple of free hours today. Refreshed and awakened sweetly. 7:00 a.m. Time in the Word is time with the Word. Today, I felt like listening to Max McClean read the Bible so I could just soak it in while I did a little watering. Listened to some Ephesians and meditated on Psalm 119 several times (go to www.biblegateway.com click on “Listen to the Bible” select your passage and let the “washing of the water of the Word” cleanse your soul…). Spread manure in corn “field”. It isn’t a true “field”, of course, for I live in suburbia. But I dedicated one of my 4′ x 4′ beds to as much corn as French-Intensive gardening will allow. We’ll be blessed to get 36 or so ears of corn out of it, but I want the grandkids to experience corn straight off the stalk and into the pot. They say corn begans to lose its’ sweetness within 8 hours of being harvested. One of my fondest memories is the summer I stayed with my relatives on a farm for a couple of weeks. At lunch time Aunt Donita would say, “I’ve got the water on. You kids run to the field and get yourself some corn.” And my cousins and I would all pick what we wanted and throw it in the pot when we got back. Then we’d gather around the farmhouse table where there would be a big plate of real butter and we’d just roll our ears of corn in it, add some salt and lots of pepper and MMMmmmmmm. This was lunch everyday. And it was God and it was good! Harvest the sugar snaps. It’s getting late. They are trying to make seed, so the pods aren’t very long and not quite as sweet as a couple of weeks ago, but I am loving them in salads and even the morning omelet. Peas are the gardener’s candy. I’ve grown regular peas, but hated the de-podding. I have grown snow peas, but but missed the fat fruit. 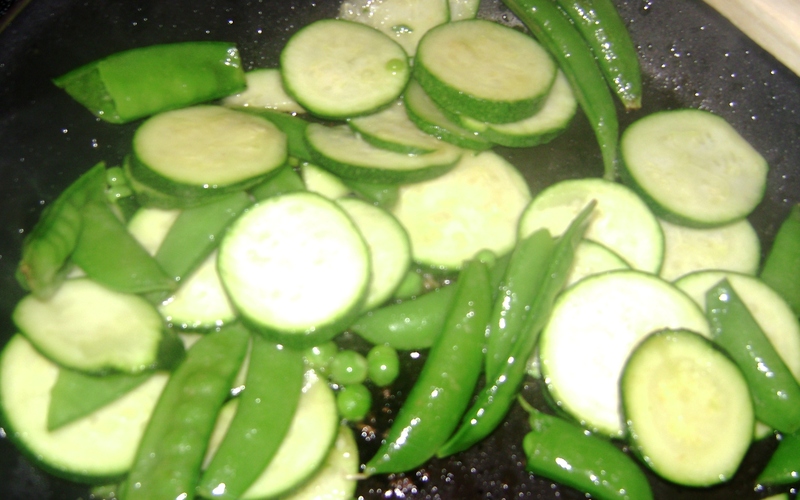 Sugar Snap peas are the best of both worlds: you can stir fry with the pod intact as it is highly edible, too, or de-pod and let the little green spheres pop pop pop in your mouth! Gemma discovered them last night and loves them, too! Tidy up patio areas and toys from last night’s pool party. The pool is up finally! It is just one of those inflatable 15′ x 3′ deep backyard sorts, but on a hot afternoon? Heaven on earth! Steph & Tris and the kids came over. Tredessa was here, too. I was sad when they went home. More water in the pool. Getting the little ones used to it slowly. Photograph Averi’s garden sign and fertilize her chiles. 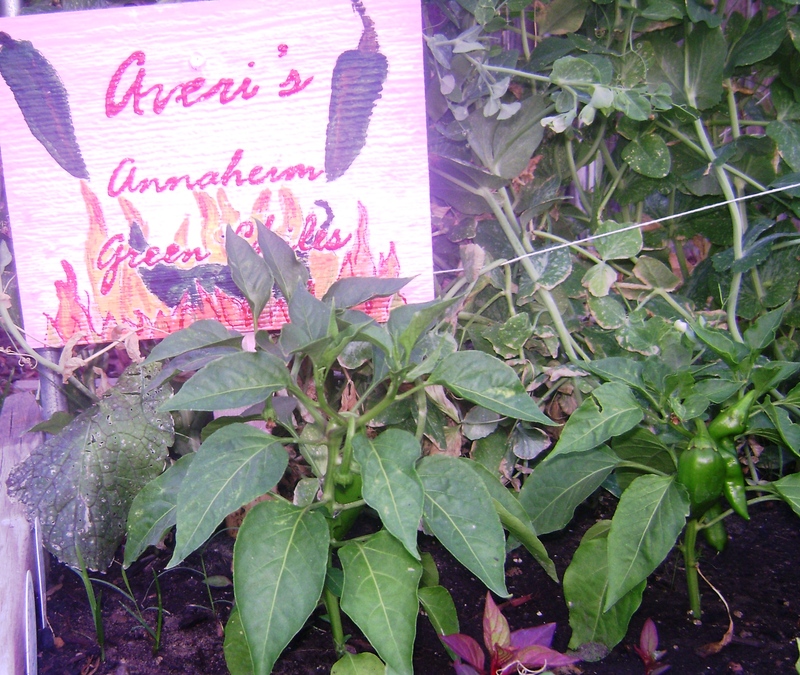 I hadn’t gotten on the chile-pepper level and was surprised to find, through the camera lense, that Averi has about 6 green chiles growing away. This is her first, and obviously already successful, gardening experience. Water the grass-seed patched areas. You’re suppose to do this in April, but grass germinates in 48 hours this time of year. 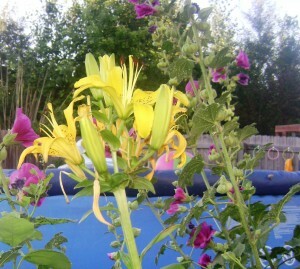 Each summer, I tend to what the crazy dog has destroyed. It is amazing how quickly grass recovers in those little patches! Water pots and veggies. With the Colorado sun, you have to do this everyday! Re-pot Stormie’s Zinnias. The library gave her some cheap seeds. They are growing beautifully in Miracle-Gro potting soil, as most things do. Gather purple Celosia volunteers for Tara, pot some up for myself. Last year’s giant pot of Purple Celosia apparently blew far and wide throughout the garden for there are small, but very happy seedlings in almost all pots, whether welcomed there or not, and in the garden beds. I’ll probably have to uproot and toss most, but I put a nice container together for Tara (who will be arriving home from a week in New York City today) because she loves her flower gardening, too, and I made myself a big pot. It will go on the tree stump near the fence on the east side where it will peek through and be colorfully framed by the yellow and profusely flowering Potentillas. No muss, no fuss. Get garlic chives under control! If you’ve bought one container of garlic chives, you’ve bought a hundred! Those little boogers are seeders, extraordinaire! Which is nice, really. When I go to the grocery store and see the little “gourmet” containers of herbs and chives, etc. that they sell for $2.99, I try to calculate the value of said spices and herbs in my own yard. One day I determined I had at least $98 worth of chives, $30-some worth of sage and $60 or so worth of a few different types of oregano. Makes me feel rich! 9:15 a.m. Finished with “chores” in the yard. Time to spare. NOTE TO SELF: Soak up a few rays before Heaven Fest (12 days away…), with proper SPF protection, of course. pictured: the pool through some lilies and holleyhocks; Averi’s garden marker (it is suppose to be a chile roasting in fire – I am no artist! ); Tre and the Kelley kids yesterday; breakfast this morning – a baby zuchini and sugar snap peas sizzling in the skillet in some olive oil with salt and garlic, mm, mm, good. The flowers look gorgeous and I am SO excited for CORN!!!!! It always seems a hastle to put up, this year wasn’t bad, some of the kids were over and helped but once it is up, I am in it every day after work!!!!! Glad to hear all is well, tho. Was beginning to think that HeavenFest thing was getting the best of ya, not many posts last week. We had a great Sunday! My daughter-in-law Shannon got baptized today! Yeah!